I must say, I loved being a part of this thoughtful coaching session, which is packed with information you can use. Get your notebook ready! Both Heather and Jaime are moms so you will see an amazing conversation between one mom business owner to another. Today, we are talking all about sales and making sure you always have potential sales coming through whether you have an offline or online business (Heather found a client at the local gym working out!). Don’t wait until business starts to slow down to scramble for new business! 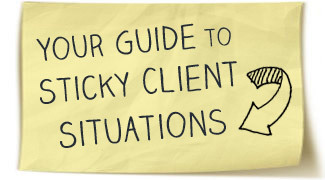 What if the majority of your current clients stopped using your services all of sudden? Or what if the products you were currently making good money from stopped selling? One thing I noticed from the past is that I spent 80% of my time on my current projects and 20% on attracting NEW business/projects, which left me always scrambling when my current work would end. When we have expectations that a customer, subscriber or engaged member will continue their business with you month after month, continually renew contracts, or buy the same amount that they did the previous month/year, we are taking serious risks with the survival of our business. In sales, we always talk about ‘the pipeline’ and if you don’t always have potential sales/revenue in the ‘pipeline’ your business will suffer and you will usually be left starting from square one. So, today I wanted to address prospecting (which I have learned should be an everyday activity) as we go through Heather’s LIVE case study. AND as always we had the opportunity to see Heather’s as an example. What we didn’t talk about was how in the world Heather is going to attract her ideal client and the all- important topic of prospecting. I brought Jaime Tardy back, founder of Eventual Millionaire, (because I think she is fantastic and she is a pro at prospecting) to coach and mentor Heather around how to think about prospecting and give her some ideas and thoughts on helping her move forward. Watch as Jaime coaches Heather (and YOU). BTW, we have developed a Prospecting Guide for you and will be sending that to you in four parts over the next month.